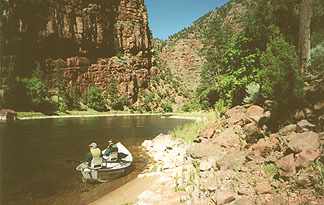 The PFF Club Green River Fishout was held during the week of June 2-10-2001. Those attending this fish out were Art Harris, Dean Chaix, Roger Finke, Karilyn and Larry Duarte, Wayne Taylor Jr. and Wayne Taylor Sr. Early on the morning we were to depart, I (WLT Sr.) received a telephone call from Art Harris informing me that his son and son-in-law could not make the trip as planned. Now, Art not wishing to drive alone to Salt Lake City where he was to pick up Dean at the SLC airport, had a problem. This wrinkle was resolved by Roger, My son and myself stopping at Art's home in Roseville and then I rode/drove with Art to SLC. Off to a titillating start, yeah? The drive to Flaming Gorge Lodge was a "piece of cake" as all proceeded well after reaching Art's home. We just enjoyed the sights and traveled in our Bermuda shorts and polo shirts in the comfort of the air-conditioned vehicles. I particularly enjoy the ride from Evanston, Wy to Flaming Gorge Lodge. The road takes one through the country side and has views of Flaming Gorge Lake and the colorful canyon walls. After settling into our accommodations and having dinner, we assembled our fishing equipment, enjoyed a bit of TV and then retired to our beds for the evening to dream of all the trout we were going to catch the next day. 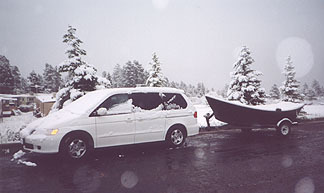 Well, when we arose the next morning we were shocked to find some 4 to 6 inches of snow on the ground, our vehicles and boats. After the initial shock, it was suggested that the river was some l000 feet lower than the lodge so possibly no snow or rain. Art, Dean, Wayne and the Duarte's went fishing. All the foul weather that was encountered by them at the river was a slight drizzle. Roger went back to bed. I did some reading. Roger and I did get to the river about noon as it had stopped snowing and the sky was clearing. I am happy to say that during the course of the week all caught and released a number of nice plump fish. All was not lost after all. Except for the Duarte's we fished the "A" section of the river each day. The Duarte's fished the " B" section with their guide a couple of days and had very good luck catching big healthy brown trout. They reported that they did not catch as many fish as when fishing the "A" section, but that the browns were larger and heavier fish and fought harder. If memory serves me correctly Karylin caught a brown that was approaching 27 inches. Nice fish. Somehow the word was circulated that Karylin caught the biggest and most fish while fishing the "B" section. What do you have to say regarding that Larry? Each and every one of us on the trip caught and released a good number of fish. Most ot the fish ranged from 15 to 18 inches. A few fish larger than 18 inches were caught one of which was some 22 plus inches. 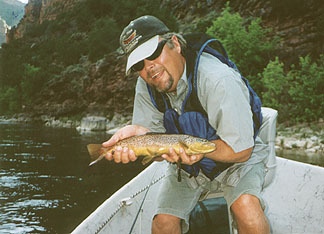 Several of us enjoyed one day or another the thrill of catching the "slam", --a rainbow, a brown and a brookie. If you are going to fish the Green River below Framing Gorge Dam, I would like to strongly suggest that you set aside a day ,tour the dam and journey to Vernal and see the Dinosaur exhibits. Both are worth taking the time to observe. We enjoyed ourselves, the fishing and all activities.